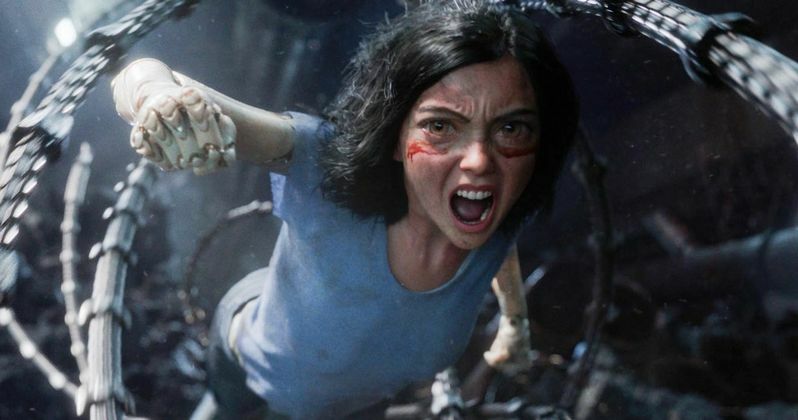 Alita: Battle Angel is a special effects marvel that raises the 3D bar. The long awaited film adaptation of Yukito Kishiro's hit Japanese manga has melt your eyeballs, stunning action scenes. The superstar pairing of producer/writer James Cameron and director Robert Rodriguez pushes cinema forward. I had high expectations for the look of the film, and am pleased to report they were completely surpassed. If only the plot matched the technical excellence. Alita: Battle Angel gets a bit hokey. The cyborg romance is sappy and uneven, along with several of the characters. The entertainment value does exceed the shortcomings. It's a big-budget, popcorn spectacle that certainly delivers the wow factor. Alita has no memory of her life before Iron City. She is intrigued by her chaotic surroundings, but even more enamored with the hunky Hugo (Keean Johnson). He introduces her to the city's favorite sport, the insanely violent Motorball. The winner of the Motorball competition gets the most desired prize, entrance into Zalem. This is the dream escape of all citizens in Iron City. Alita becomes obsessed with Motorball for a slew of reasons. Her incredible abilities attracting the attention of Motorball's ruthless administrator (Mahershala Ali), and his chief technologist (Jennifer Connelly); who has a long history with Dr. Ido. Alita's crush on Hugo seems straight out of a cheesy, young adult romance. Her big manga eyes fluttering like a butterfly at everything Hugo does. The human with cyborg intimacy is innocent enough, but borders on the weird and creepy. The film thankfully never treads too deeply into the physical. The romance arc is pivotal to the plot. It needed a less smitten approach. The puppy love scenes are the valleys to the action peaks. Alita: Battle Angel's supporting cast is loaded with Oscar winners. They needed character development worthy of their talent. Christoph Waltz, Mahershala Ali, and Jennifer Connelly aren't given much to do. Their characters are more robotic than the cyborgs. This is done to a point on purpose. Cameron wants Alita to have more human feelings that the actual humans. He makes this clear early, then repeatedly comes back to it. This reinforcement detracts from the supporting characters. They have backstories that warranted more range. It would have added greater realism to their interactions. Emotional nuance apart from Alita would have tempered the heavy CGI. Alita: Battle Angel is rated PG-13, but feels more intense. There are scenes where cyborg limbs are ripped off for black market parts. This may scare the daylights out of younger children. Alita: Battle Angel is a guaranteed hit with cyberpunk, manga, and science fiction fans. More straightforward audiences will be won over by the amazing effects. See Alita: Battle Angel in the best theater possible. It's a premier experience that's worth shelling out extra. Alita: Battle Angel is distributed by 20th Century Fox.